Carfax Free Report Example | What’s Inside A Carfax History Report? 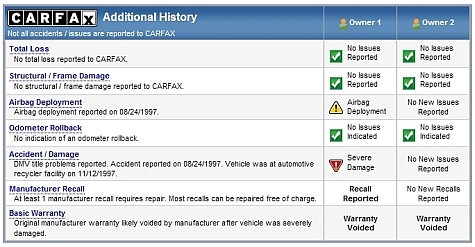 Carfax Free Report Example: What’s Included In A Carfax Vehicle History Report? Essentially a Carfax vehicle history report is made up of the following sections: Vehicle overview, price calculator, ownership history, title history, additional history and detailed history. 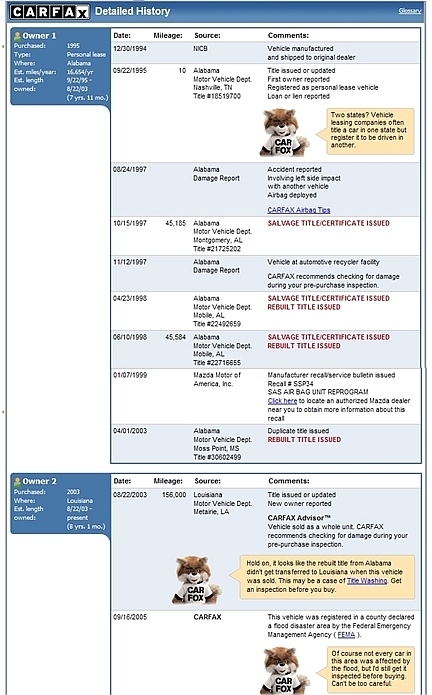 In the screenshots below I will break down each section and show you exactly what you are getting with a Carfax vehicle history report. The vehicle overview section will provide you with standard details about the make and model of the vehicle. It also includes an overview of pertinent information you will find throughout the report. As you can see from the screenshot below, the Carfax vehicle history report reveals that this 1995 Mazda 626 has some title issues, 2 previous owners and a last reported odometer reading of 156,000. The red and yellow caution signals signify something that should be looked into more closely before purchasing. The price calculator is a handy tool that evaluates the report and tells you if your vehicle is worth more or less than the standard retail book value. As you can see below, the Mazda we are checking out is valued $470 LESS than book value. The ownership history will give you great insight into how many owners a vehicle has had, where the owners were located and if the vehicle was for personal or business use. The title history will tell you if there are any reported title problems. 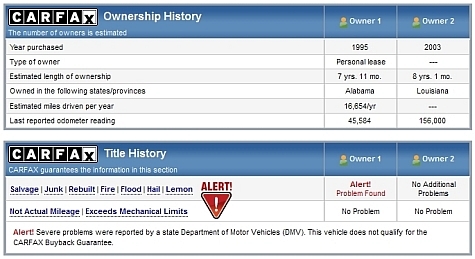 In our example report below, the red alert sign tells us that there are title problems with this vehicle. 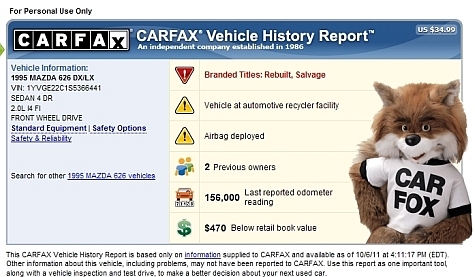 The additional history section of a Carfax vehicle history report dives further into the overall history of the vehicle. In this section you can find out if the airbag has been deployed, if there is frame damage, if there has been a reported accident or if there has been a manufacturer recall on the vehicle. As you can see, our Mazda has been in a severe accident, had the airbag deployed and took part in a manufacturer recall. The detailed history section of a Carfax vehicle history report is where each important event in a vehicle’s lifespan is broken down for you to read about. Each event is represented with a specific date, mileage, source and comments. Carfax also breaks down which owner had the car when the events in question occurred. Besides the information outlined in the screenshots above, a Carfax vehicle history report also provides you with a warranty check and safety report on the specific vehicle make and model. In closing, this Carfax free report example overview should clear up any questions you might have about exactly what you receive when using the Carfax service. I can also view my complete Autocheck overview here so you can compare the two reports side by side. *** We Suggest Using AutoCheck For Your Vehicle History Needs – Click Here To Get An AutoCheck Vehicle History Report Now! Next post: Free AutoCheck Report Example: What’s Included in an AutoCheck Vehicle History Report?